Here's another 80's thriller that I never got around to for some reason. When I recently discovered that Dan O'Bannon was responsible for the script, I jumped at the chance to finally give it a shot when I saw the blu ray cheap at my local Target. Plus, it stars Roy Scheider, who I just love to death in anything, especially his 80's output. What really sealed the deal for me though was also learning that Malcolm McDowell plays the villain. Sold! The cast. Really, you can never go wrong with Roy Scheider in a starring role. For as many films as he's headlined in his long career, I'm still shocked that he isn't regarded more highly, or considered one of the best. It's almost criminal if you ask me. Tagging along with Scheider for the majority of the film is his partner, played by a super young Daniel Stern, who looks like he just graduated high school. Who knows? Maybe he had? And to round out the primary players, the one that really surprised me, Malcolm McDowell. I had no idea he was in this, but after learning he was and that he was the villain, well you can imagine my excitement. Blue Thunder just became a helluva lot more interesting. The structure. I'll be honest and say that for the first half hour, nothing seemed to really "grab" me. In fact, I was almost ready to give up on it. Everything just kind of seemed a little too "ho hum" for my taste. But, I kept reminding myself of the pretty great names attached to this in front of and behind the camera, and so I stuck it out, and boy am I glad I did. Let me just say that Blue Thunder did not turn out the way I had expected it to, and for the better. I kind of half expected a pretty straight-forward story about a copter pilot fighting crime and whatnot, only to be thoroughly impressed by the film taking a "man on the run and needing to clear his name" approach. So what I thought would be a paint-by-numbers actioner instead turned out to be a cat-and-mouse thriller that had me on the edge of my seat for the entirety of the films second and third acts. Stuntwork done right. One of the best thing about films made in the 80's was that they had to do a lot of the stunts and effects work legitimately, without the use of CGI or green screens. Sure green screens were available then, but they hadn't yet reached the realistic level that would be required for a lot of the helicopter scenes. So instead most of the flying work you see is actually being done, complete with the actual actors in the cockpit, which is really kinda nuts when you see the film. I'm actually surprised they got away with a lot of what they did. And then there were a lot of scenes where models were used, which was also breathtakingly awesome. I wish films would go back to this method. Seriously. The model work was so incredible that the only reason I know they were models was simply that the sequences were just too epic in execution and there was just no way they were able to get a helicopter to do those things back in 1983. That right there is a testament to some great practical effects work. If you want to see a good example of how not to do the effects, watch the slightly similar Firefox, directed, produced and starring Clint Eastwood a year earlier. The tension. As I stated before, the film played out much differently than I had anticipated, and in doing so, really kind of blindsided me. Instead of a cheesy action film about a revolutionary helicopter fighting crime in the city, we're treated to an expertly structured thriller about a man who uncovers an assassination plot, resulting in a target on his head, and will stop at nothing to clear his name and bring those down to stop the plot from unfolding. 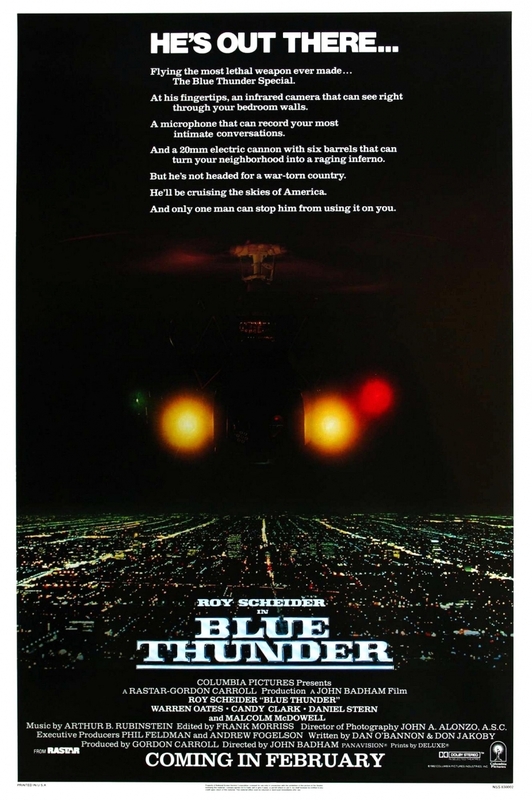 Blue Thunder easily could have fallen prey to the same issues that turned Clint Eastwood's Firefox (1982) into a complete bore. I appreciate his attention to detail, but my god that film was long, and dull, and while it was a thriller as well, there were very little thrills to be had. Thankfully writing partners Dan O'Bannon (Alien, Lifeforce, Total Recall, Return of the Living Dead) and Don Jakoby (Lifeforce, Death Wish 3) do a knockout job keeping the audience on their toes and on the edge of their seat. Directed by John Badham. Really, this is nitpicking, I know. But I have never liked John Badham much as a director. He's very bland and uninteresting. Yes, he's made some very memorable films, I'll admit that. 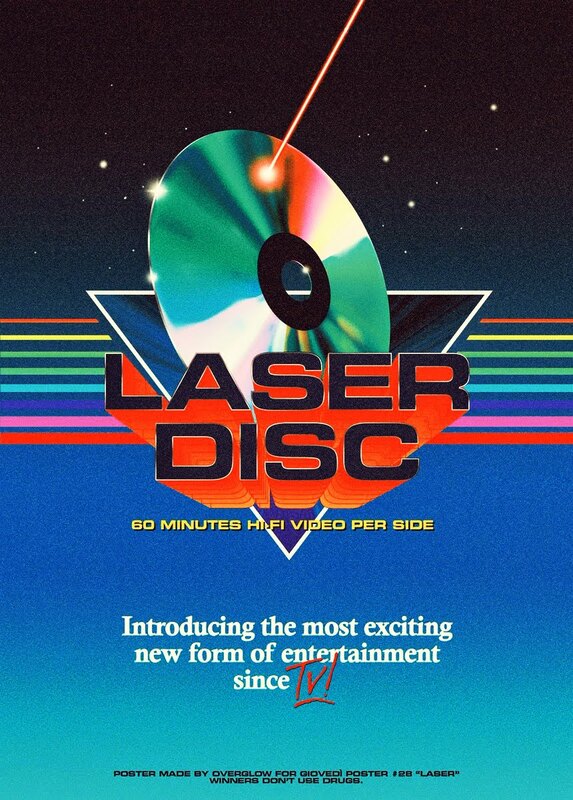 Saturday Night Fever, Wargames, Short Circuit, Stakeout, all classic films. He gets the job done; no frills, no style, and that's kind of how I've always thought of him, much like Roger Spottiswoode (Shoot to Kill). It's as if the visual aspect of his films come as an afterthought, with zero effort put into how stylish the film will be. I remember being a teenager and seeing Point of No Return at the theater and just being so shocked at how bland his remake of a visually brilliant film was. I just couldn't get past that, and the same problem plagues this great film. I'd say 90% of this film was shot using handheld, which was annoying, and just felt very lazy. 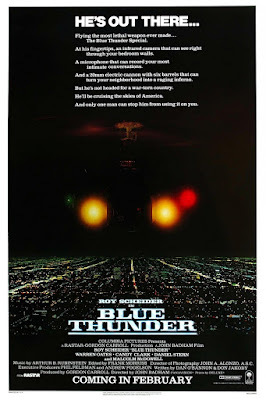 I saw so much potential to make such a visually arresting film, and had someone else directed it, like say.....Tony Scott, Blue Thunder would have been kicked up about another 10 notches of awesome. As it is, because of the combined strengths of O'Bannon, Jakoby, Scheider, and McDowell, the film is already awesome. It works, it delivers, and it packs a punch. But I can't help but think of how much better it would have been with a more interesting stylistic approach. Despite my 1 single issue of it being visually uninteresting and lazy, the fact is that Blue Thunder was awesome. I loved it. This is the kind of film you watch as a reminder of how films used to be made, structured, and executed. With expert craftmanship to the story. You can currently pick up the Mill Creek Entertainment Blu ray rather cheaply, for about $7 at most department stores like Target and Walmart. But be warned, while the transfer is solid, there are zero special features and subtitles. So it's about as bare bones as you could possibly get.